In a world increasingly dependent on science and technology, Australia is facing a tough new challenge: building an innovation nation, starting with our kids. To address this issue, consulting firm PWC has developed the 21st Century Minds (21CM) Accelerator Program to grow and scale Australia’s best STEM education initiatives. Twenty initiatives have been selected to participate in an accelerator program to help them expand their activities across Australia. In early March, participants met with industry collaborators and accelerator providers for a two-day forum. Ideas were shared, feedback given and participants met with the professional experts who will be helping them expand their initiatives over the coming year. Participants in the 21CM program had the opportunity to learn about what their peers were working on, from the latest robotics equipment to clever and engaging science experiments. Project owners were each invited to think more deeply about their purpose and mission, and how they could make more impact. 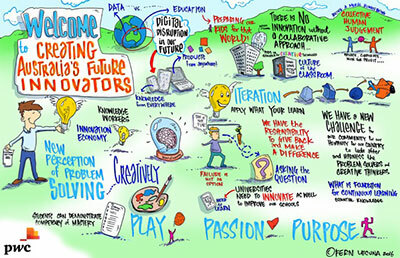 The forum coincided with a public event for educators and industry partners at which Havard expert Tony Wagner gave his views on how to create future innovators. This was followed by a panel discussion during which Australian leaders joined Dr Wagener to discuss the opportunities and barriers for education excellence in STEM and innovation. Watch a video of this discussion. PWC has recently made STEM education its priority area for Corporate Responsibility. Research released by the company in 2015 identified that the key to Australia’s growth – both economically and by reputation – is innovation and STEM. While up to 44% of our jobs are at risk of digitization and digital disruption, PWC argues that by shifting just 1% of our workforce into STEM roles, Australia could increase its GDP by $57.4 billion dollars. Its new report, Making STEM a Primary Priority, continues to explore how Australia can adapt its education system tp develop a skilled workforce. The report identifies a continued and systemic underachievement in STEM education in primary schools. This becomes increasingly concerning given the decline in numbers of STEM students in both high school and at the tertiary level. PWC’s call for the universal introduction to critical and computational thinking in primary school is echoed by many including Google’s engineering chief Alan Noble. This approach, they argue, will provide youngsters with the strongest possible pathway to engage and excel in STEM fields. Find out more about the 21st Century Minds Accelerator program. Inspiring Australia is working with PWC on this initiative as a national collaborator.